Dark Chocolate Truffles from Hell! Why are they hellish, you ask? Because you won’t be able to stop eating! Seriously!! Five pounds added to the hips in the last few days, my friends! So, you still want the recipe? OK. If you say so. Melt 16 ounces of chocolate in a double boiler. Then, add 1 cup of coconut cream and mix well. Add 1/2 cup of coconut oil and mix well. Add cordial and mix well. Pour this into a bowl/baking dish and place in the fridge for 4+ hours, until it’s completely cooled and hardened. Once the filling is hardened, use a spoon to scoop out small amounts and form into ~1 inch balls (yes, your hands will get messy). Roll these in the cocoa powder and cinnamon and place on wax paper on a cookie sheet. (I rolled the filling into balls and gave them to my daughter to roll in the powders. That kept us from making a huge gooey mess.) Place the cookie sheet back in the fridge to make sure they are nice and hard again. Melt 8 ounces of chocolate in a double boiler. Add 1/4 cup coconut oil and nutmeg. Mix well. 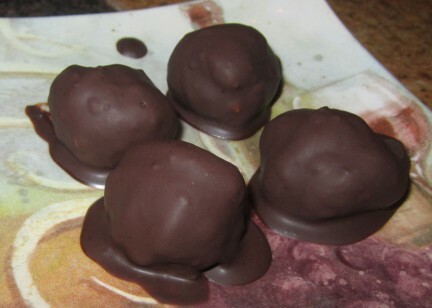 Take the truffles out of the fridge and dunk in the melted chocolate, placing them back on the wax paper. 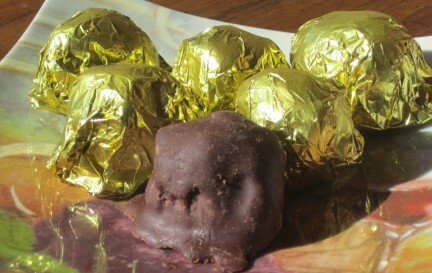 (I put one truffle at a time in the chocolate and fished it out with a spoon.) Put back in the fridge until hardened. These are fabulous treats for parties, gifts for friends, late night snacks while in a hot bubble bath….. I think these with rose petal cordial would be great for Valentine’s Day. I might try some lavender cordial this summer!! Yum! Ooooh, mint cordial would be nice, too!! Ack! Somebody stop me! Dang! I am going to have to try this recipe… think it would be as good without one of your magic cordials? I haven’t made a tasty cordial before.